With winter just around the corner many Minnesotans are pulling in their boats and closing up cabins for the season. It’s the time of year when the Department of Natural Resources (DNR) asks every cabin and lakeshore owner to watch for aquatic invasive species (AIS) when removing docks, boat lifts, swim rafts and other equipment from the water. Do you know that LLAA volunteers like Al Kiecker, pictured below, have been been testing for zebra mussel veligers (larvae) for the past two years? 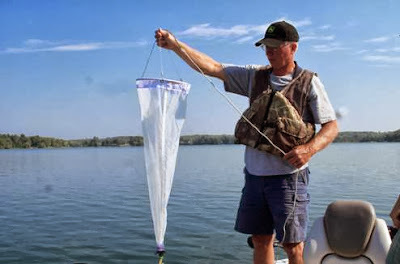 Any veligers are contained by the extremely fine mesh net and the samples are analyzed at a cost of $90, paid for from your annual membership dues. NO zebra mussel veligers have been found in our Long Lake samples. Female zebra mussels can produce up to 1 million eggs per year. Fertilized eggs develop into microscopic, free-living larvae (called veligers) after about 3 to 5 days and disperse by free-swimming for up to a month. Al Kiecker and other members of the LLAA Water Quality Monitoring Team have been trained by RMB Environmental Laboratories, coordinated by the Hubbard County Soil and Water Conservation District. LLAA has purchased the plankton net, which is very fine mesh (64-micron). The composite sample from 3 specific locations is preserved with 91% Isopropyl Alcohol, and sent to RMB for analysis. Because zebra mussel veligers are microscopic and are not visible to the naked eye, they can inadvertently be transported in bilge or bait water from an infested lake, thus the Minnesota law against the transport of water in boats. Drying for at least 5 days, or immersion in very hot water, kills the veligers and any adult zebra mussels. News brought to you by the Long Lake Area Association: LongLakeLiving.org and LongLakeLiving.org/Protect Our Lake page.